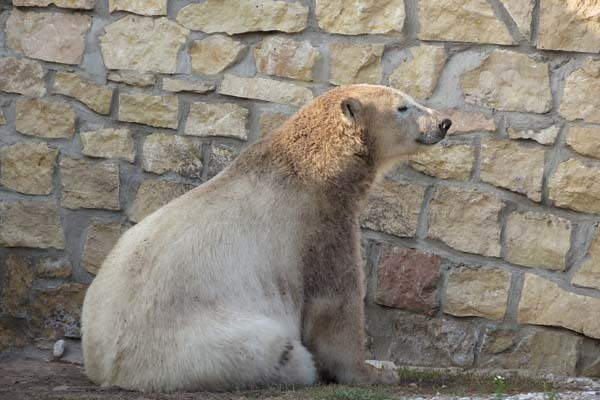 We like to look the polar bears in the zoo, but there’s no doubt – the bears also enjoy looking the zoo visitors. 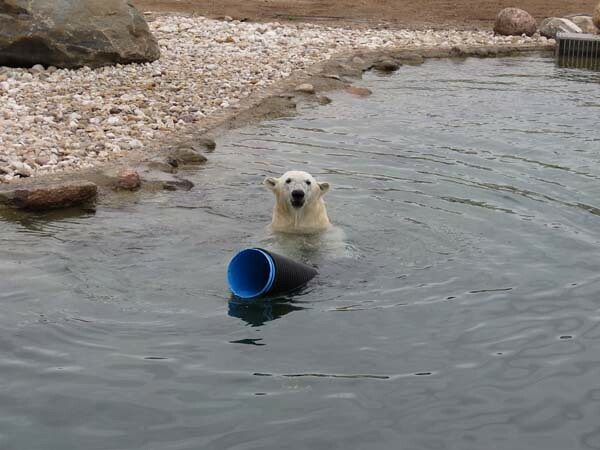 Our young polar bear boy Aron enjoys the public very much. One of his favorite activities is to pose for the audience. 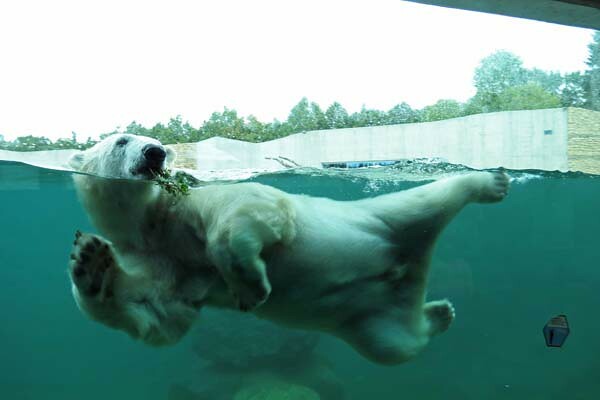 If there stay a lot of people behind the glass, it’s especially interesting for him: he swims and dives near the glass only, putting his nose from time to time against the glass. Sometimes this show will last even some hours. It’s nice to present some favorite toys, too. 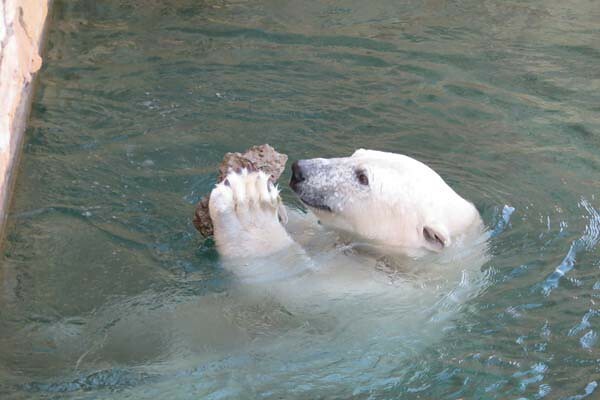 He dives and find one stone in the water, which he keep as much as a favorite toy. He plays with this for a long time. 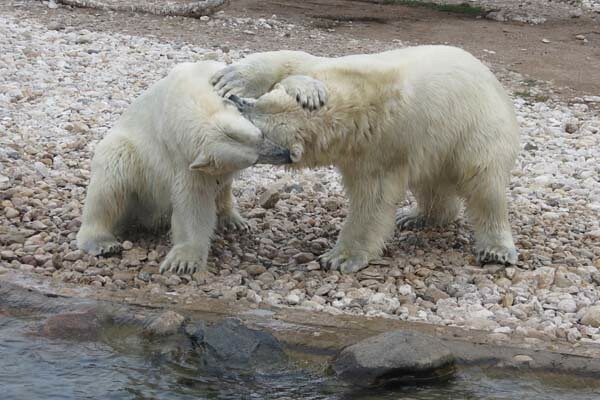 It’s also fun to play sometimes with mom Friida. Aron likes playing with the pipes. 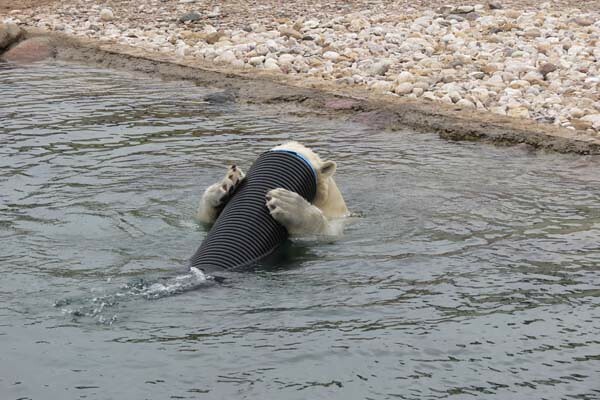 It’s so nice for him to do different tricks with them: he looks through the pipes- as if they are binoculars, he keeps them on his nose.., swimming with them is his usual doing. After swimming, Aron loves to roll himself on the ground. That’s the reason, why he often looks like a little brown fur ball! 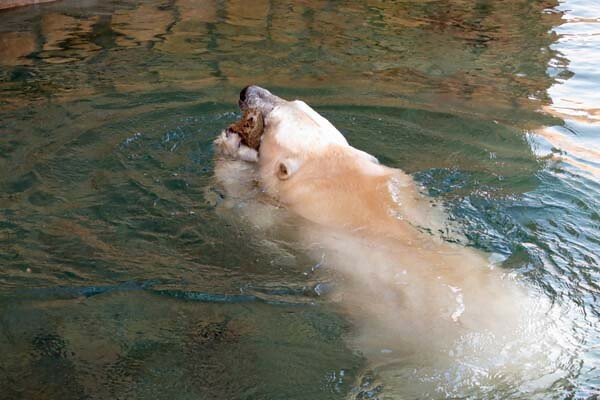 Mostly he swims and plays for a long time, gets tired and just falls asleep. 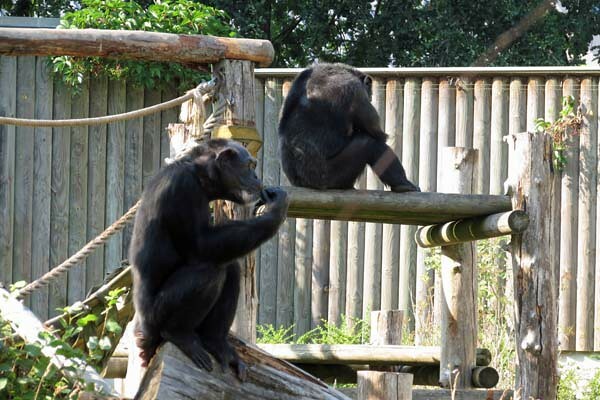 There are 3 chimpanzees in our zoo: 1 male (Pino) and 2 females (Quincy and Betty). They climb on the trees or “ride” along the rope. Of course, they love just pose or sleep, too. 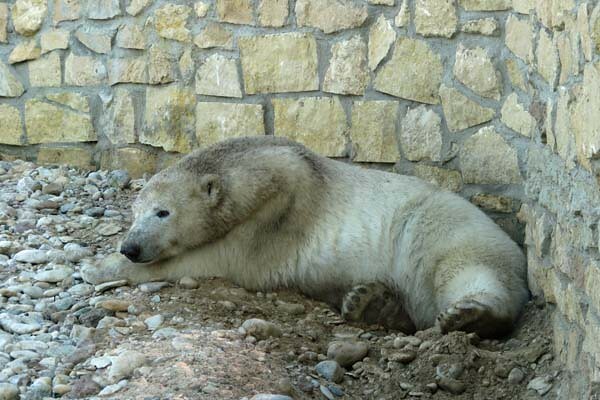 In winter, when they lived indoors, I saw how they liked watching television! it is wonderful to see Aron through the glass at swimming. He plays very good with Frida too. They both habe very nice enclosure. 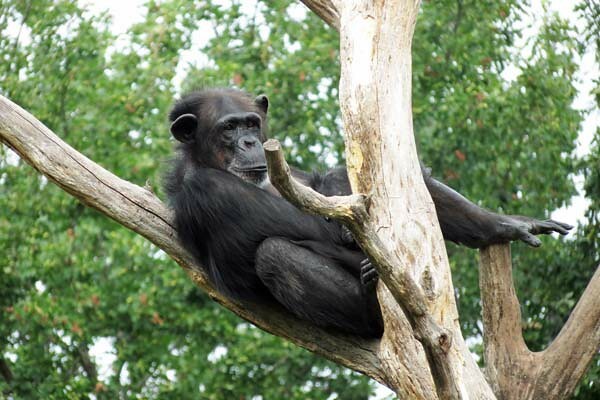 The chimps have the nice area too. 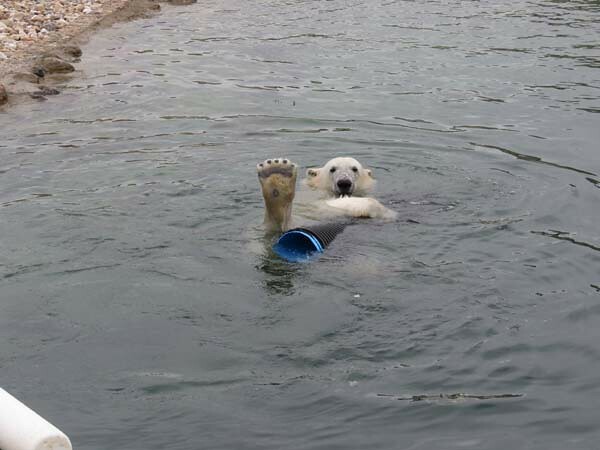 When I tell my friends ‘I had a nice chat with a polar bear’ they start rolling their eyes and I can see they think I’m crazy. 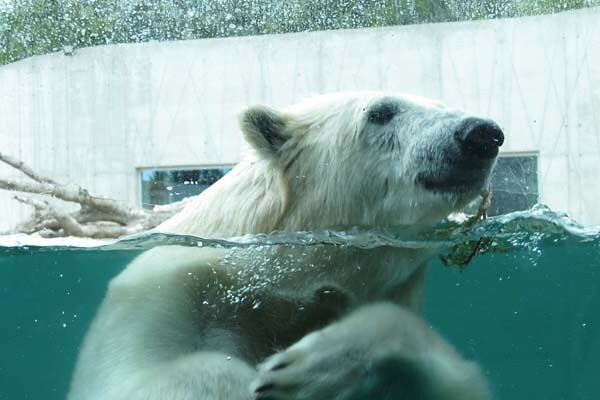 🙂 However, I’ve spent many fantastic moments ‘communicating’ with a polar bear when he/she has come close to the glass. There are many ways! We could see that even in Ralph’s report from Aalborg. That’s why I’m sure Aron loves to ‘chat’ with his visitors. Your report shows clearly he’s very aware of his audience and very eager to ‘communicate’ with them. I love all the photos – no matter if Aron is playing with his toys, fooling around with mama Friida, meeting his visitors or just sleeping dressed in a cappuccino coloured fur. Even the videos are great! Thank you so much for this delightful article! 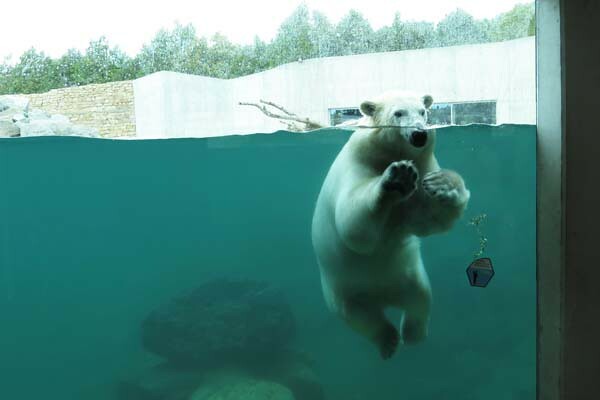 We never knew this before Knut and all the others we got to know because of him. 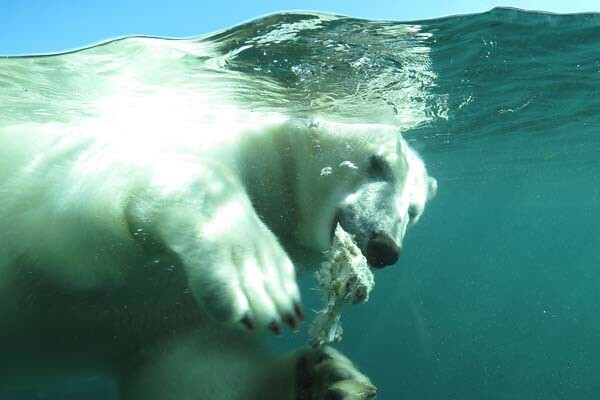 It´s a special pleasure to watch a polar bear playing and having fun, all the more when he or she is presenting us a private show of his/her skills. 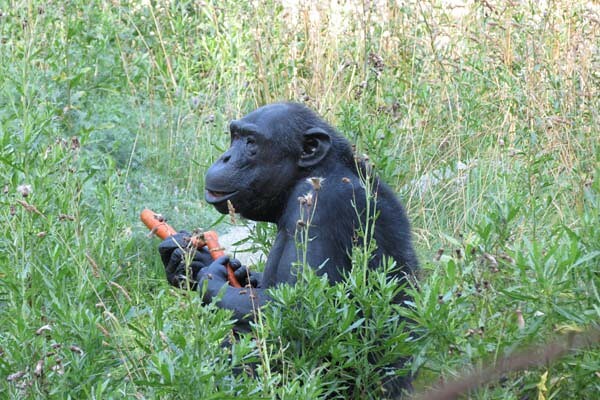 These are again fantastic photos of Friida and Aron with their different toys! 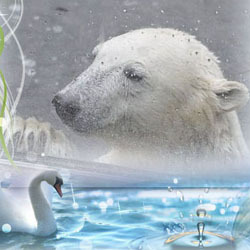 The underwater pics and the video at the pane are simply gorgeous! 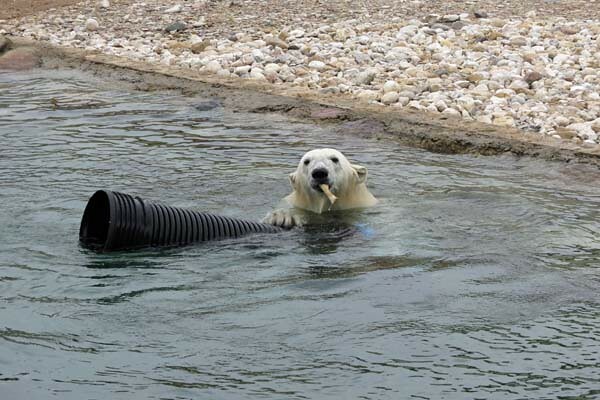 A loving mother, yummy food, enough space around, a big pool of fresh clear water, diverse toys and pipes, provided that they are interesting or big enough, the adoring glances of the vistors, there isn´t much more a young polar bear in a zoo could want. Thank you for bringing us these wonderful impressions. thanks for the nice pictures of Aron. 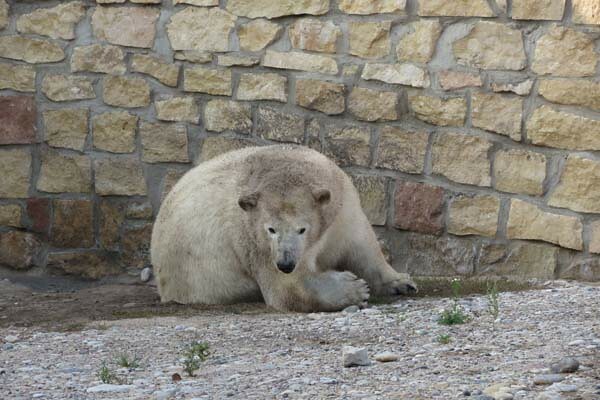 What pleases the visitors in the zoo, saddens the users of the webcam. 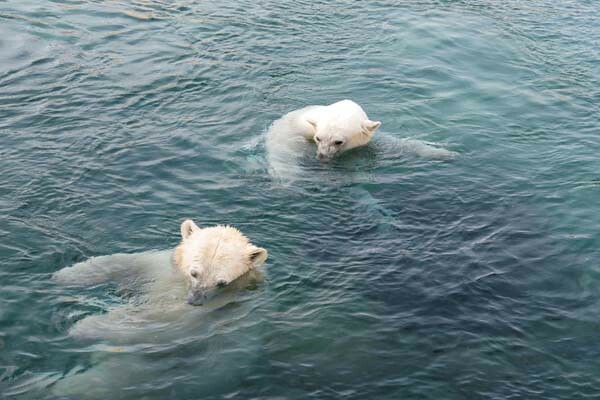 You rarely see the polar bears there, but unfortunately. Arons Charmeoffensive ist bezaubernd, davon hätte ich auch gerne ein Selfie! und Cappuccino Bären mögen wir doch alle, nicht wahr? Uli, danke für die näheren Informationen zu den drei Schimpansen! Each word you did write here and each picture you did show us in your report proves at its best how much you love YOUR pretty white giants in Tallinn. ARON gives the impression he is fully contented. For sure he is at one with himself and with his visitors (and most probably also with his keepers, etc.) . . Both, mother and son, FRIIDA and ARON look georgeous. Who bites who during rough playing? I am unable to take them apart. Thank you very much, dear EVI, it was fun to read and watch. 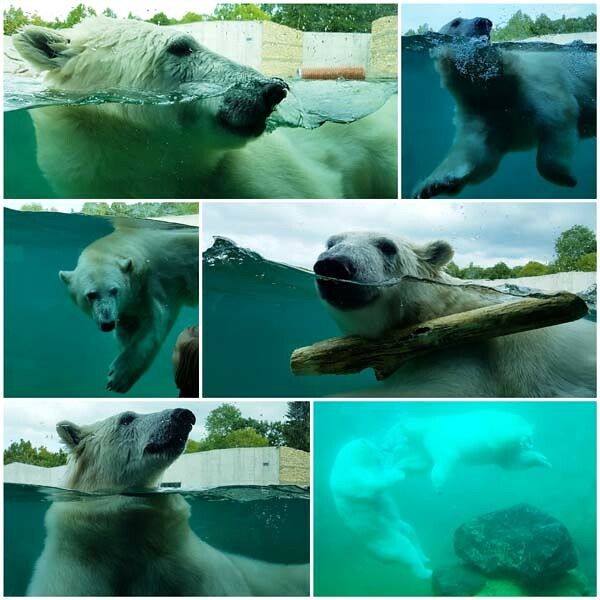 Thank you so much for the wonderful pictures of Aeon and Friida. I can imagine standing at the glass talking to him and watching him with his toys. 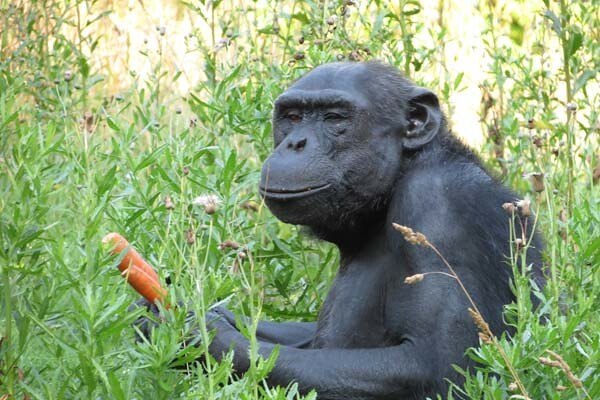 The little family of chimps are eating carrots, which are often also enjoyed by Polars. 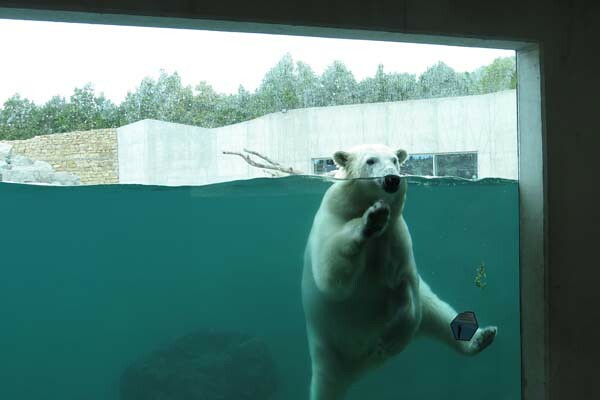 Of course, polar bears like to look at people. This is a great occupation !!! I recently had the luck to be alone with Quintana for about 50 minutes in the morning. Thank you very much for your nice report, the nice pictures and the great videos! Was für ein toller Schauspieler, man sieht, wievielte Spass ihm seine Show macht. 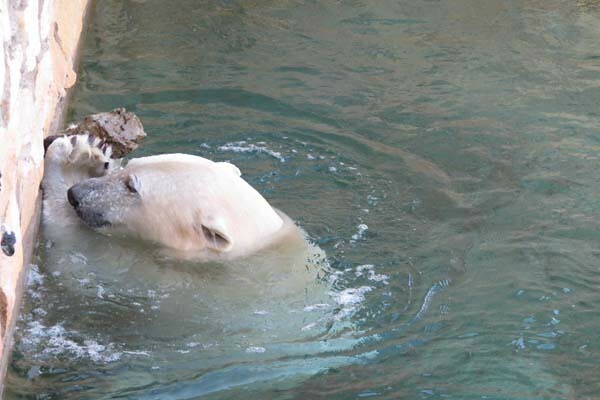 The polar bears really like to “converse”with their guests. 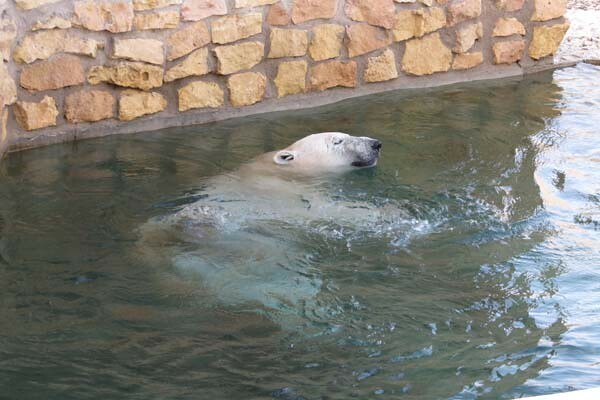 When our polar bears lived in the old territory behind the steel bars, I visited Nora very often and I always watched her for a long time. 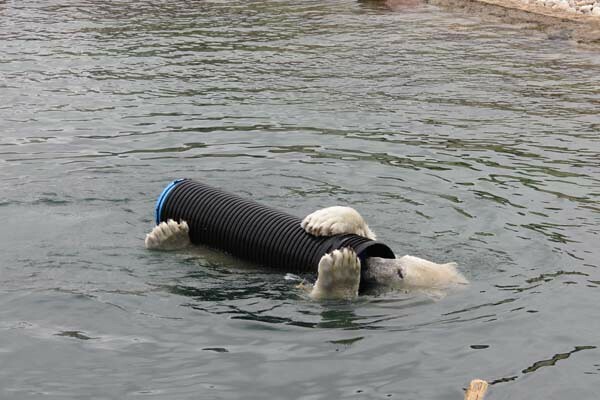 It’s great, that we have the zoo cameras! 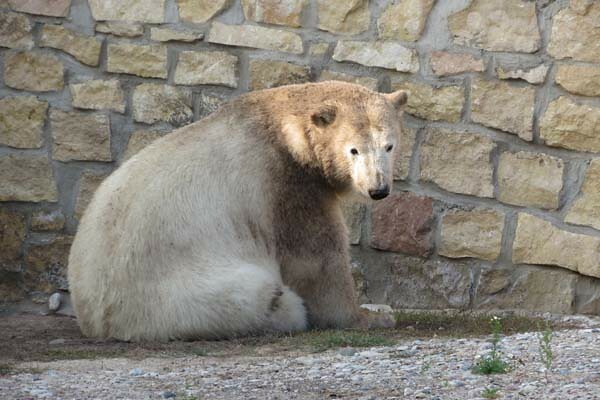 Before I’ll visit the zoo, I always can check: the bears are out or they aren’t. Otherwise, it may happen that I will not see them. Independent of where you are staying. Log in | 52 queries. 0.819 seconds.